3 Bedroom Terraced House For Sale in Manchester for Offers Over £110,000. This spacious three bedroom mid mews property has an enviable cul de sac position. This well presented property features a spacious lounge/dining room, fitted kitchen, three good size bedrooms and a modern fitted shower room. 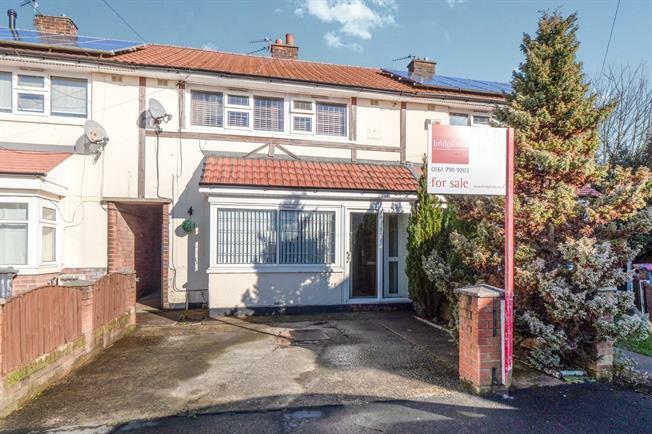 There is a good sized garden to the rear enclosed with panel fencing and parking area to the front, this is an ideal family home or investment. Double Glazed patio door leading to front garden, door through to hallway. Wooden front door. Radiator, carpeted flooring, textured ceiling, ceiling light. Double glazed UPVC window facing the rear overlooking the garden. Vinyl flooring, tiled splashbacks, textured ceiling, ceiling light. Roll edge work surface, fitted wall and base units, stainless steel sink with drainer, space for gas oven, space for washing machine, dryer and fridge/freezer. Triple aspect double glazed UPVC bay windows facing the front overlooking the garden. Double Glazed patio doors leading to rear garden. Radiator, laminate flooring, under stair storage, textured ceiling, ornate coving, ceiling light. Loft access . Carpeted flooring, ceiling light. Double bedroom; double glazed UPVC window facing the front overlooking the garden. Radiator, carpeted flooring, textured ceiling, ceiling light. Double bedroom; double glazed UPVC window facing the rear overlooking the garden. Radiator, laminate flooring, ceiling light. Single bedroom; double glazed UPVC window facing the front overlooking the garden. Radiator, laminate flooring, built-in storage cupboard, ceiling light. Double glazed UPVC window with opaque glass facing the rear. Heated towel rail, vinyl flooring, tiled walls, painted plaster ceiling, ceiling light. Low level WC, single enclosure shower and thermostatic shower, pedestal sink. Enclosed garden area to rear with shared walk way to front.